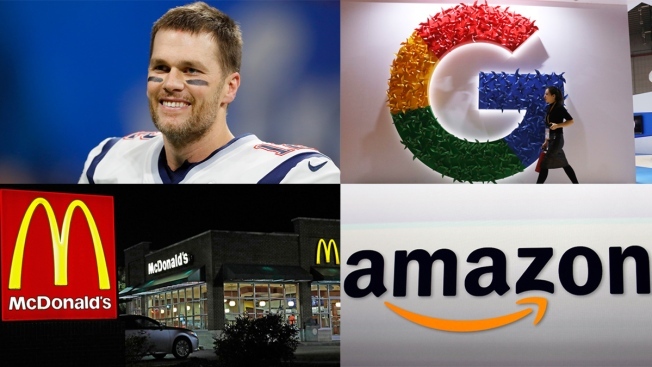 New England Patriots quarterback Tom Brady, Google, McDonalds and Amazon all participated in April Fools' Day pranks. It’s that time of the year again when popular brands' “new” product announcements may dupe the gullible and give others a good laugh. Here’s a list of April Fools’ Day pranks to look out for as you scroll through social media today. If you’ve ever wanted to know what your plants are thinking, a new Google translator has got you covered. Yesterday, the technology company unveiled the software that will allow users to communicate with their tulips. A preview of the translator demonstrated that tulips love water and they’re willing to listen to you describe your grandchildren. The Dutch university in charge of much of the project's research is also trying to communicate with cacti, but the plants’ personalities are just as prickly as their spines. The service is only available on April 1, which is Google’s kind hint that the service is an April Fools’ joke. Introducing Duolingo Push! We're taking notifications out of your phone and into the real world. Yup: Duo the Owl will literally show up to remind you to practice so you never miss a lesson. Anyone with the language app knows just how aggressive its reminders to continue lessons can be. There are many Twitter meme threads devoted to making fun of the app’s notifications. At least the company knows how to laugh at itself. In honor of the pranking holiday, the app announced a new notification service that would take “notifications out of your phone and into the real world.” Duo, the company’s owl mascot, will appear before you to give a “subtle reminder” to continue practicing so you don’t break your learning streak. Talk about taking aggressive notifications to an all new level. Some commenters figured out the update was fake because the sample height detector skipped from 5’9 to 6’0. Reactions to Tinder’s prank have been mixed. Many Twitter users hoped the company would actually implement a height verifier while others called for a weight verifier, too. For those who love to dip their fries, nuggets and even apple pies in their shakes, the fast-food chain plans to launch four shake sauce dips matching its milkshake flavors. If only it weren’t an April Fools’ Day joke. The prank reminded some Twitter users, like MSNBC’s political correspondent and “Kasie DC” host, Kasie Hunt, of their own dipping habits. “This might be a joke but some of us have been literally going to Wendy’s for years instead so we can dip fries in our chocolate Frostees,” Hunt tweeted. Fresh Direct, a grocery delivery company, announced the launch of Caulk, its brand of cauliflower milk. The YouTube video describing the new type of milk drops clues that it might still be in the inventing stage. Each cup of Caulk has “100% of the daily requirement of vitamins A, C and D.” The voice-over announces a plethora of Caulk’s other health benefits before finally wishing viewers a happy April Fools’ Day. Watch the video to see what other jokes you can find. Good things really do come in small packages. From bite-sized burgers and “donuts too tiny to share,” Amazon will deliver your miniature food order for free today only. This might be a joke, but you can, in fact, get free delivery on a regular size order today if you use the promo code TINYFOOD at checkout. Burps are useful after all. SodaStream, the sparkling water maker brand, partnered with retired U.S. astronaut Scott Kelly on a new water bottle that can turn your burps into water. The International Space Station’s carbon dioxide removal system inspired the made-up invention. Now, here’s an April Fools’ prank that all dog owners wish was true. Starbucks unleashed plans for a cafe chain for dogs. Even if you’re not a fan of April Fools’ Day pranks, watch the video for the stampede of puppies and dogs frolicking through the set. Who said you need a time machine to travel back to the ‘90s? To give drivers’ that blast from the past they’ve been yearning for, Honda outfitted its 2019 Passport mid-sized SUV with your favorite ‘90s relics. Coin holder, beeper mount, fold-out maps, disco lights and CD player included. Toyota posted a single photo of an SUV cruising through water on its Facebook page in celebration of April Fools’ Day. The new vehicle is part of the company’s goals to take its cars off-road and off-shore. In a breaking news announcement, the United States Open Tennis Championships announced that the 2019 tournament would be the first to add puppies to the ballperson team. Ballpersons retrieve and supply balls to players and officials. The ballperson teams are now accepting applications, and all breeds are welcome. Potatoes are so last year. Hasbro must have thought so, too, when they decided to replace the iconic Mr. Potato Head children’s toy with Mr. Avo Head. The new toy even comes with headphones, black frame glasses, a topknot and a full beard in true millennial fashion. In celebration of its centennial season, the Chicago Bears football team will be sporting new jerseys that add a one in front of every number. Was this a bad joke? New England Patriots quarterback Tom Brady joined Twitter today to announce his retirement from professional football to his fans’ sadness and his rivals’ glee. The announcement came more than a week after former teammate Rob Gronkowski retired from the team. In an article titled “For cramped New York, an expanding dining scene,” an L.A. Times food reporter describes New York as a “culturally bereft island.” The article also said that New York’s “scrappy culinary scene” is gradually changing the city into a “legitimate dining destination.” Before you start sending the author angry emails in defense of New York, be advised that this is a satirical commentary on a real article. In a 2018 article, The New York Times claimed Los Angeles had an “absence of strong institutions to bind it together” and that the city’s news media lack the “different voices and the kind of competition that can ensure a live civic debate.” You reap what you sow. Would any of these April Fools’ Day pranks have fooled you?